Festival season in New Orleans begins in earnest this weekend with the return of the Buku Music + Art Project, a two-day celebration of electronic dance music, indie rock, and hip-hop. The festival, now in its fourth year, takes place in the Warehouse District, with stages right along the Mississippi River and inside the Mardi Gras World warehouse. Headliners include Bassnectar, ASAP Rocky, TV on the Radio, and Die Antwoord. Buku has grown considerably since its inception in 2012, with attendance increasing from 5,000 people a day to 14,000 a day between years two and three. But despite that, festival producers still try to keep the young festival unique and intimate. Part of keeping the festival intimate comes from the producers’ emphasis on incorporating New Orleans arts and culture into Buku. Throughout the weekend, local street performers will showcase their talents across festival grounds, as well as in the Bukulture Tent, a special performance area that serves as a lively counterpart to other Buku stages. 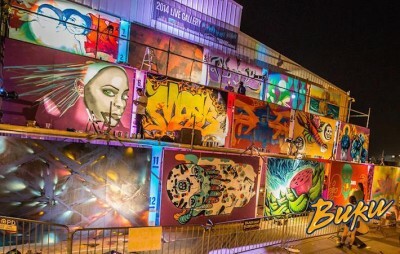 Another Buku staple is the signature Graffiti Wall. Each year the festival invites notable street artists to participate in a live graffiti gallery. Artists paint over the course of the weekend and then auction off their work. “It’s cool for everyone because the gallery starts as 17 blank canvases,” said Dante. “But by the time the festival ends it’s a completely different thing.” Other festival elements include the BuKook-off, a cooking competition where fans submit a Buku-inspired recipe, and then four people are chosen to cook their dishes on site for guest judges that include G-Eazy and local restaurant owners. Each of Buku’s four main stages offer something a little different. The Power Plant stage provides a more traditional outdoor-music-festival vibe, while the Float Den stage, located inside the Mardi Gras World’s float-manufacturing warehouse, feels more like an underground dance party. The Ballroom stage emulates the music venue experience, and the Back Alley stage sits alongside the river, giving dance music fans an exceptional view of the Crescent City Connection bridge. There’s also a Riverboat VIP Stage that has special performances throughout the weekend. Buku’s emphasis on electronic music makes for some loud, bass-heavy musical sets. After some noise complaints in 2013 – the music was audible as far away as the Treme and Bywater – producers sought out a team of audio engineers as part of a huge effort to reposition stages and keep sound from traveling across the Mississippi and bothering local neighborhoods. Producers end music at the outdoor stage around 11pm. The festival is produced by Winter Circle Productions and Huka Entertainment. It takes place on Friday, March 13th and Saturday, March 14th. For more information check out their website. San Francisco-based house and techno producer with a penchant for bump-and-grind baselines and weird, infectious hooks. Popular New York City rapper who incorporates a variety of styles and influences, including gangster rap and electronic music. Prolific indie rock band from Portland, Oregon combines psychedelia with 70’s rock and Americana. Australian electronic duo that mixes synth pop, glam, and EDM. One-of-a-kind, high-energy South African rap/rave group. Quirky, local indie-rock seven piece that often uses Creole and Cajun French language in their lyrics. Brooklyn indie rock veterans with a post-punk vibe. Indie electronic duo from Seattle produces percussive, dreamy, synth-driven pop. Massachusetts-based electronic pop band that grew from Berklee College students to international, festival-headlining superstars. Longtime dubstep DJ known for bass-heavy live sets with elaborate stage lighting. Rapper, songwriter, and producer with numerous viral mixtapes, G-Eazy also recorded a number of singles while at Loyola several years ago. Above images courtesy of Buku.